Morning sky looking east as seen from Adelaide at 6:00 am local time on Sunday May 1showing the crescent Moon near Venus, Mars, Mercury and Jupiter. Similar views will be seen elsewhere at the equivalent local time. Click to embiggen. May has lots of action in the morning skies. The bright planets form and reform in spectacular alignments. Mercury, Mars and Jupiter join Venus for an extended planet dance with Venus coming close to mercury and Jupiter. Every morning the lineup changes, so there's lots to watch. Venus is now a gibbous shape in small telescopes. Venus meets up with the crescent Moon twice this month. Saturn is past opposition, when it is biggest and brightest as seen from Earth. Saturn is still an excellent telescopic object in the evening. 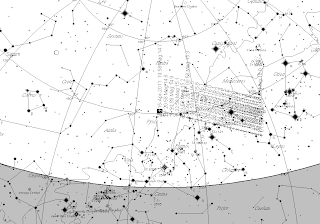 Good telescopic observation can be had from around 9 pm on. 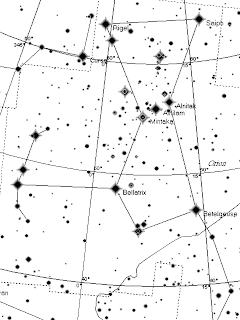 The Eta Aquariid meteor shower should put on a nice show this year. Although the peak is on the 6th of May, Australians should see the best rates on the mornings of 7 and 8 May. Carnival of Space #195 is here. Carnival of Space #195 is now up at The Next Big Future. There are lumpy planets, microspacecraft, project Icarus, a Chinese spacestation and much, much more. Head on over and have a read. There is a combined footpath bicycle path that runs behind the dunes of the local beach. A little while ago the city council put in viewing platforms where people could stop, rest and look out at the view. As well, they put in some wooden pillars with information plaques on the history, plants and animals of the area ... and the constellations. The Natural History and history information is fairly accurate and fascinating, but the constellations ... not so much. To start with, the initial panel shows an apparent polar region of the sky with completely imaginary stars. How hard would it have been to use real star positions? Then there is Orion, one of the classic constellations. I've contrasted their illustration of Orion with the actual constellation below. They used the correct southern hemisphere orientation for Orion, which is a good start, then it gets a bit sad. Now, I am quite aware that there are a variety of design issues that would prevent a realistic portrayal of the constellation, but the artist left out Alnilam, the brightest star in Orions' Belt! It probably wouldn't matter so much, but the "saucepan", formed by the belt and the stars of Orions' sword, is a classic Australian asterism, the second most recognised asterism after the Southern Cross. The artist put a lot of effort into Orions' shield (although the location of Tabit is wrong, it should be the leftmost star), how much effort would be needed to get Orions' belt right? Then there is the constellation layout of the platforms themselves. According to the information plaque, each platform is laid out in a pattern of an easily recognised constellation. Except they aren't. I suppose the Orion platform could be representing Orions belt, but they left the sword off. It certainly doesn't look like the "saucepan" we know and love. 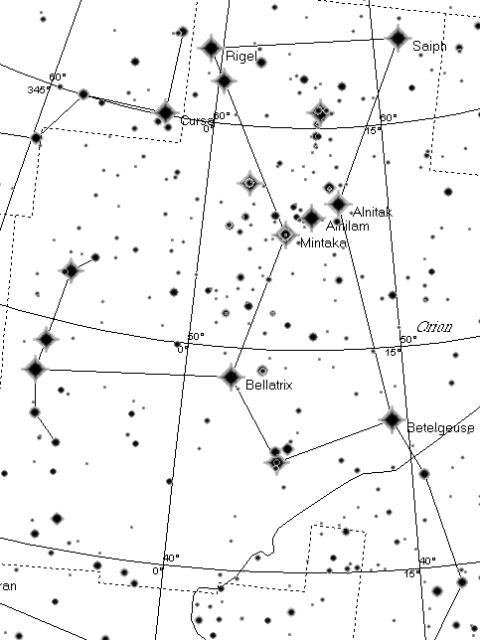 The platform for the Southern Cross has at least the major stars in the right position, but what is with the minor stars? They are nowhere near where the should be. The plaques could at least be re-drawn to show the stars more correctly, but the stars on the platforms are concreted in and can't be moved. I think this kind of outreach is fantastic, and the Council and their artists, and information people did a great job with the natural history and the history. We always take visitors to the platforms when we take them down the beach. Why- oh-why couldn't they get the astronomy right? Couldn't they at least have had an astronomer eyeball the designs before they started laying them down? 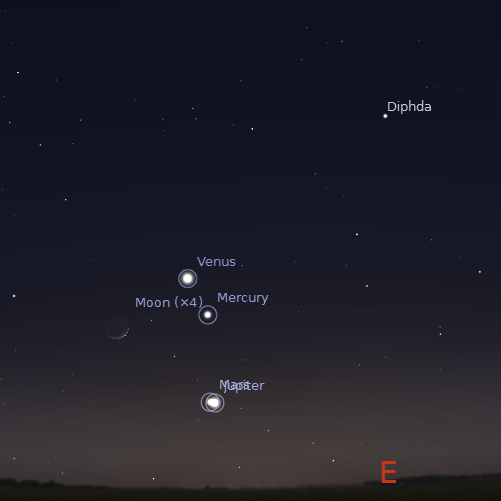 Morning sky looking east as seen from Adelaide at 6:00 am local time on Saturday April 30 showing the crescent Moon near Venus, Mars, Mercury and Jupiter. Similar views will be seen elsewhere at the equivalent local time. Click to embiggen. Hope you are having better luck with the planetary line-up than I am. After my first decent picture the morning clouds closed in, and now we have predictions of rain all weekend for here in South Australia. Still with the Moon close to Venus on the 30th of April and 1st of May, it is well worth chancing the weather to go out around 6:00 am (maybe a little earlier, probably best between 5:45-6:15 am), to see if you can see this fantastic line-up. You will need a faily clear eastrn horizon to see Mars and jupiter at their best. You can also use this as an opportunity to see Venus in the daylight. Carnival of Space #194 is here. Carnival of Space #194 is now up at The Next Big Future. There is screaming exoplanets, driving planetary robots, planets with binary suns, vostock, the end of the shuttle fleet and much, much more. So head on over and have a read. Look, I don’t want to make this blog all Elenin, all the time (despite the fact that it is a nice little comet), but some of the “it’s Elenin we are all doomed” posts on the web can be used to illustrate some astronomical principles. Reader Kevin Heider alerted me to this video on YouTube, purporting to show comet Elenin hurtling towards us[#]. Now, it’s not Elenin, but reviewing the video and thinking about what you see can help people understand the sky, and what comet hunters are up against. 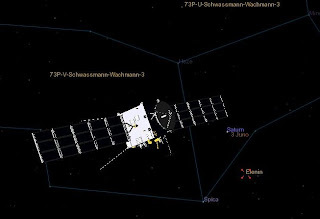 Celestia Images showing the view from the STEREO Behind satellite. 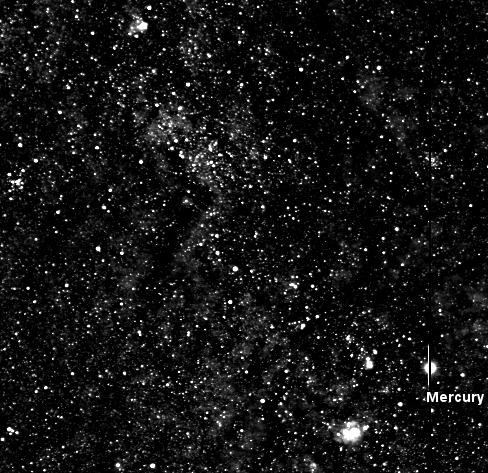 Left Image; Mercury, Vesta and the clusters and nebula in Sagittarius in the range of the H1 camera. Right Image; comet Elenin, behind the STEREO Behind satellite, out of range of the H1 camera (click to embiggen). The images showing the purported Elenin come from the STEREO Behind space craft. Now as people know I’m a great fan of STEREO. I’m part of the Stereohunter comet hunters group and Comet Al and I discovered Mercury’s tail in STEREO images. So I have a bit of an insight into the images, I also have access to a lot of tools most people don’t have, so it’s easier for me to analyse these images. It was made doubly easier because I had my own STEREO images from that time frame, as I was looking for comet C/2011 C1 McNaught which is in the STEREO frame (but not in the video images, that section is cropped out of the video, and it’s insanely faint anyway). Looking at the video, three things jump out at you that should make you suspect this is not Elenin. Firstly, the images are highly exposed, the faint Milky Way is extraordinarily bright, and details are blurred. The purported Elenin is a large fuzzy blob, not looking comet-like at all. Secondly, even though the entire image is overexposed, the purported Elenin is very bright. 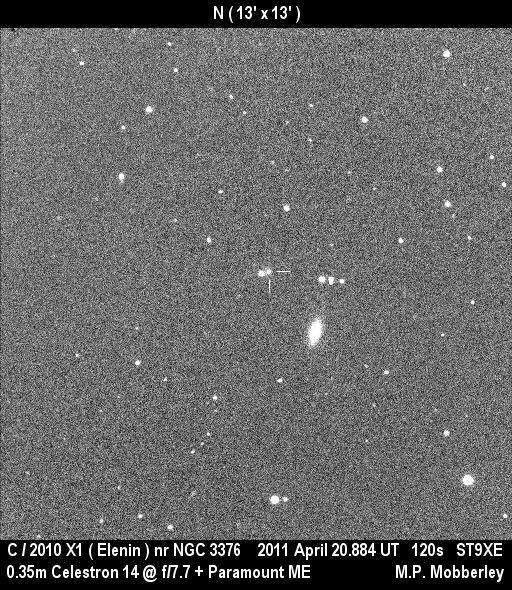 Elenin is currently very faint, visible in only large amateur telescopes (see images here and here), so it shouldn’t look anything like that. In fact, Elenin is dimmer than C/2011 C1 McNaught, which is barely visible in the STEREO images (all props to Comet Al’s eyesight). Finally, look carefully at video, you can see that while the entire frame moves due to the orbit of STEREO around the Sun, the mysterious object stays still with respect to the stars, while Mercury zips past the stars. 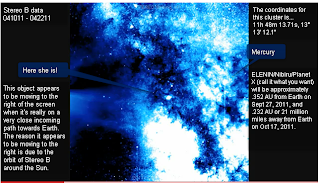 I've done my own video (see YouTube image below), where I have aligned the frames so the backgrund stars don't move. You can clearly see the object doesn't move. Also in the full frame but cropped from this video (otherwise the video would be huge) is the asteroid Vesta, and the comet C/2011 C1 McNaught (and Pluto, but it is too faint for the STEREO imager). These also zip along with respect to the stars. In fact any Solar system object bright enough to be picked up by STEREO will move against the background stars as it orbits the Sun. A distant object might move slowly, but it will move visibly over this time frame. So the mystery object is not a planet, comet or other solar system object. What is it? Here I show an image that I made from the STEREO files, I haven’t cranked the brightness up so you can clearly see it’s a bunch of stars with an associated nebulosity, it’s obviously some sort of star cluster. Now you could go to a planetarium program and try and sort out which one it is, which is not a trivial task[*]. This is where my tools come in handy; I had already loaded that field into astrometery.net to identify the stars in the field in preparation for comet so I knew that the object was M8. It is identified as the hourglass nebula on the astrometry field, but it is part of M8 which makes up the entirety of the object. Astrometery result showing the objects in the STEREO field of view (click to embiggen). When you see something like the video we just discussed, think to yourself, what would an object orbiting the Sun actually do? What other objects could look like this? Is what we see consistent with what we know about this type of object. Every day, comet hunters around the world are faced with the challenges of sorting out camera defects, cosmic ray artefacts, passing asteroids and all manner of distractions as they hunt for new comets. Do you think they would miss something obvious like the object in this video (remember it was in a series of images with a genuine faint comet)? So now you have some of the tools needed to sort out reality from hype, and some of the tools comet hunters use. [#] I suspect this is a wind-up or hoax, rather than a genuine “look I’ve found Niniru/Elenin” video, it is still good for learning purposes though. [*] The video actually give the coordinates of the object, which if you plug this into say, WikiSky will bring up M8 . This is why I suspect the video is a hoax or windup. 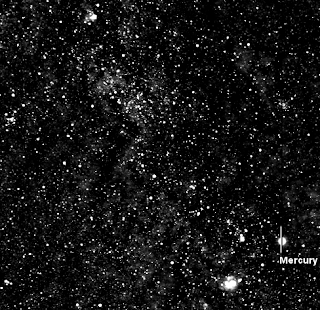 Mercury and M8 in the STEREO imager. Venus, Mercury, Mars and Jupiter form a line in the early morning sky (6:15 am 26 April), as a jet contrail passes through. You will need to click to embiggen to see Mars. I've been trying to get an image of the line-up for days now, but either bad weather or other issues prevented me. I finally got this image standing on the beach, looking back towards Largs North. And wouldn't you know it, bad weather is forecast for the days when the Moon joins them. The New Moon is Tuesday May 3. Venus, Mercury, Mars and Jupiter are visible lined up in the early morning. Jupiter becomes more prominent this and comes close to Mars. On April 30th and May 1st the crescent Moon joins the line up for spectacular views. 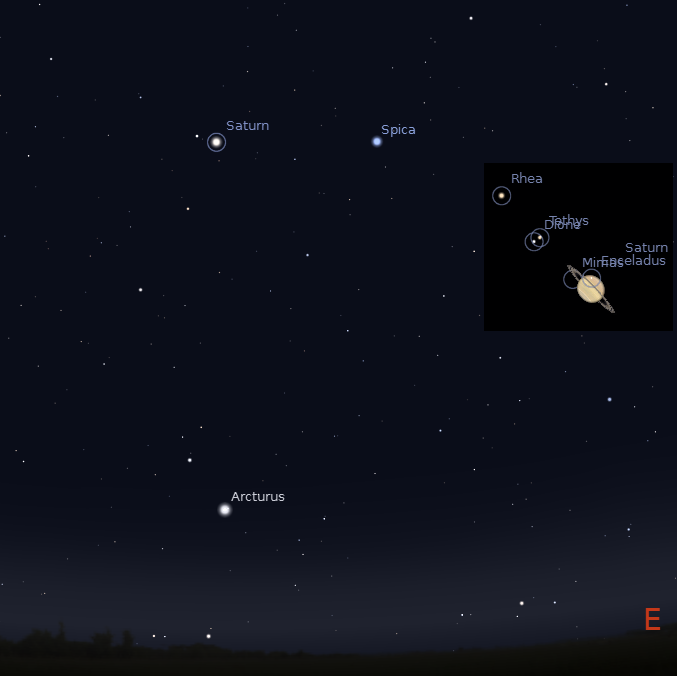 Saturn is well placed for telescopic observation in the evening sky. The New Moon is Tuesday May 3. This week sees a spectacular line up in the morning sky. Bright white Venus is readily seen in the early morning sky in Pisces. Venus is "gibbous" phase, and will progressively become more full (and smaller) over the coming weeks. Below Venus are Mercury, Mars and Jupiter. 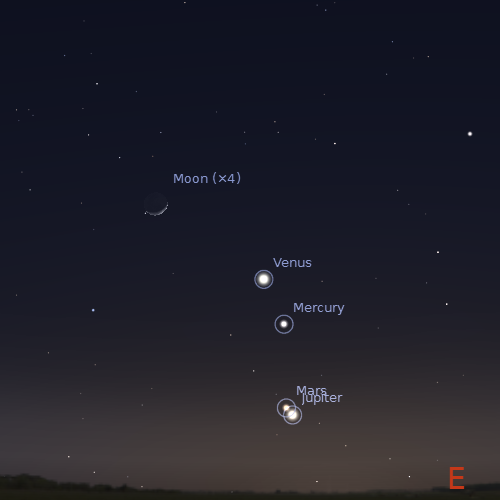 Mercury is readily visible in the eastern twilight below Venus. As the week progresses it will become even more prominent and draws closer to Venus. The pair are very close by the end of the week. Mars and Jupiter are below the pair, with Jupiter closing in on Mars. Jupiter and Mars are at their closest on May the 1st. Jupiter may be initially difficult to see if you do not have a fairly clear, level eastern horizon. However, by the time of the Mars encounter it should be easy to see. The Moon joins the line-up on April the 30th and May the 1st making for a spectacular display in the morning sky. 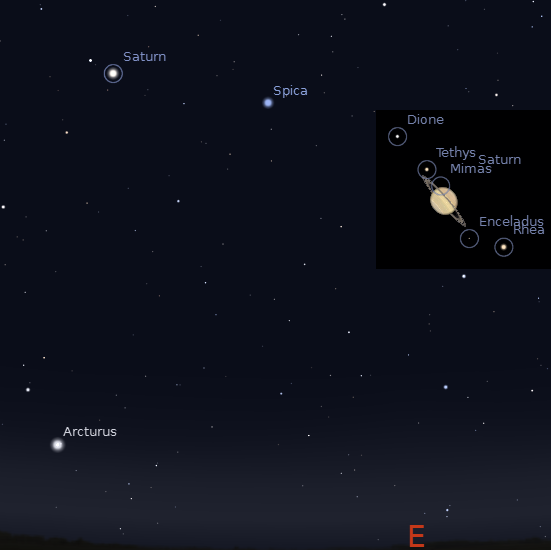 Evening sky on Saturday April 30 looking east as seen from Adelaide at 8:00 pm local time in South Australia showing Saturn near Spica. Similar views will be seen elsewhere at the equivalent local time. Inset,the telescopic view of Saturn on the 30th , you will need a fairly large telescope to see any moon other than Titan. Click to embiggen. Saturn is rising with sunset, and is visible all night long. It is high enough for telescopic observation in the evening. It is readily visible as the bright yellowish object not far from the bright star Spica. Even in small telescopes you can see Saturn's rings and it's moon Titan. Saturn was at opposition on April 4th, when Saturn was at its biggest and brightest. Despite opposition being past, Saturn will be big and beautiful for many weeks to come. The asteroid Vesta is quite faint (magnitude 7.6), so you need binoculars to see it and may need to watch over a number of nights to make sure you are seeing it. Currently Vesta is in the Sagittarius Capricornius boundary, not near anything interesting. Vesta is brightening and will be (just) visible to the unaided eye in a few months time. 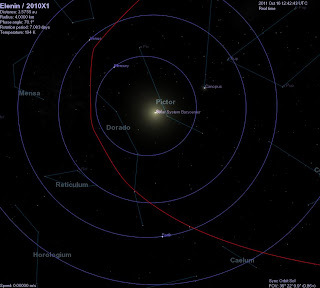 A chart showing Vesta's location is here. Comet Elenin: the FAQ for the worried. Breaking News: Comet Elenin appears to be disintegrating. Yep, it's disintegrating. As of October 15 no confirmed sighting of the comet has taken place. Will the remnants of comet Elenin hit the Earth? No, they will come nowhere near us. Will it Hit Earth: No, its closest approach is 0.23 AU on Oct 16, 2011, where 1 AU is the distance from the Earth to the Sun. To put this in perspective, this is only a little closer than the closest approach of Venus to Earth, and roughly 100 times the distance from the Earth to the Moon. This distance is from the latest MPEC ephemeris which is based on over 100 observations from multiple observatories that have been continuously tracking the comet, so it won't change appreciably. But its Earth MOID is only 0.03 AU! MOID stands for Minimal Orbital Interaction Distance. It is how close the orbits are together, not how close the objects are themselves. It's important for objects that have multiple return orbits, like potential asteroid impactors, but not for a one-off visitor like Elenin (well, you could wait for another 10,000 years or so). Earth and Elenin themselves never get closer than 100 times the distance from the Earth to the Moon. Will it Cause Earthquakes, Abnormally High Tides or Other Disasters: No, Elenin is a mere 3-5 kilometres across and has less than a billionth of the tidal force of the Moon at closest approach (as well as a negligible magnetic field). If the Moon can't cause the poles to tip, cause massive tidal floods or earthquakes, Comet 2010 X1 Elenin won't. We've been closer to other comets before with no ill effect. But What About Mensur Omerbashich's Paper that Says Elenin is Causing Earthquakes? It shows nothing of the sort, earthquakes are no more common during comet alignments than at any other time (see here for an update, earthquakes still not caused by Elenin). But it's bigger than Jupiter! No, that's the coma , the thin haze of gas and dust that surrounds the comet nucleus. The nucleus of C/2010 X1 Elenin is roughly 3-4 Km in diameter and Elenin has a coma around 50,000 km wide at the time of writing (which is a third of the diameter of Jupiter). The average density of the coma is about the same as the density of the atmosphere on the Moon. A coma is a feature of all comets that approach the Sun closely, for example comet 81P Wild (nucleus 4 Km diameter) had a coma of 50,000 Km and 103P Hartley had a coma of 150,000 Km. The Great Comet of 1811 had a nucleus of around 30km in diameter and had a coma nearly as big as the Sun. Comet Halley is 6x15 km and had a coma 100,000 km wide when it last approached Earth. We survived them all (and 103P Hartley came nearly twice as close as Elenin will), and we will survive Elenin without incident. The size of Elenin has been independently confirmed (well, it's probably smaller), by observation of the orbit of the small asteroid 1999 RQ176 when it had a close encounter with Elenin. But I Can See a Picture of it in WikiSky, it's HUGE! That is the carbon star CW Leonis. Didn't it Just Cause Saturn's Tilt to Change? No, the author of that article didn't realize that telescopes invert the image. But Brown Dwarf Stars are so Cold, you Can't See Them. No, coldest detected so far is ~370K (about the temperature of a hot cup of tea), the the warmest are around 2200 K, and most range between 500-1000 K. They may not produce much visible light, but they reflect light. Jupiter has a composition similar to those of Drown Dwarf stars. Jupiter's cloud tops are a chilly 128 K and it reflects light just fine. Any Brown Dwarf in the inner solar system would be painfully obvious. Will Going Through the Comets Tail Affect Us? No, should the rather small tail of Elenin actually pass over us, it's doing a pretty good imitation of a vacuum (about 100 atoms per cm3). We have been through bigger and denser comet tails before with no effect whatsoever (especially the Great Comet of 1861). Why isn't Comet Elenin in the News? For the same reason that the other 16 comets discovered in 2010 didn't get in the news, or the 5 comets discovered in 2011. They are all dim. The News is only interested in comets that are spectacular, readily visible to the unaided eye or are being visited by spacecraft. Comet 2009 P1 will be as bright, if not brighter than C/2010 X1 Elenin, but that's not in the news either. Amateur and professional astronomers are watching comet Elenin and others avidly, but the news channels don't care about our obsessions with faint fuzzies. Why Can't I Find Information of Elenin at the NASA Website? Because NASA is not the arbiter of all things astronomical. You won't find information on C/2009 P1, C/2011 C1 or any of the faint comets discovered during 2010 and 2011. NASA does have information of comets that its spacecraft have visited, or are interesting in some other way, but it's not an exhaustive comet site like Cometography or Aerith. I Saw Comet Elenin Near the Sun in August 2010/Now: In August 2010 only really powerful telescopes could see Elenin. You saw Venus. If you are seeing something bright near the Sun in the morning sky now, it's Venus. I have Photographed/ Seen a Photograph of a Double Sun, is this Elenin? It's lens flare. Is this Video from Auckland Elenin? No, it's just a jet contrail. Carnival of Space #193 is here. Carnival of Space #193 is now up at Robot Guy (well, it's been there a while now but I've been somewhat distracted). There's lots of Black Holes, Spacecraft and a Galileoscope. Recharge you batteries and head on over. Lost opportunities; I knew the homoeopath was going to mention quantum mechanics, but I didn't do a section on that, when I said "lets wait a bit" in response to the homoeopathic sleeping tablet overdose, I should have said, "if this was real medicine, we would be in hospital having our stomachs pumped now". Oh yeah, and to all the sceptics who signed up to my twitter account, this blog is mostly "look up it is pretty" astronomy, although I am on a bit of a roll with my comet Elenin and Nibiru posts, the "life in a meteorite" flap, the odd global warming post too and of course Intelligent Design creationism. The Last Quarter Moon is Monday April 25. Venus is visible in the morning sky in the constellation of Pisces. 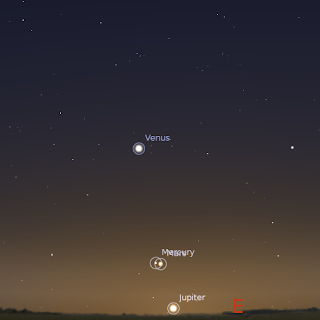 Mars, Mercury and Jupiter are visible below Venus in the early morning. Mercury and Jupiter become more prominent the week, and Jupiter closes in on Mars. 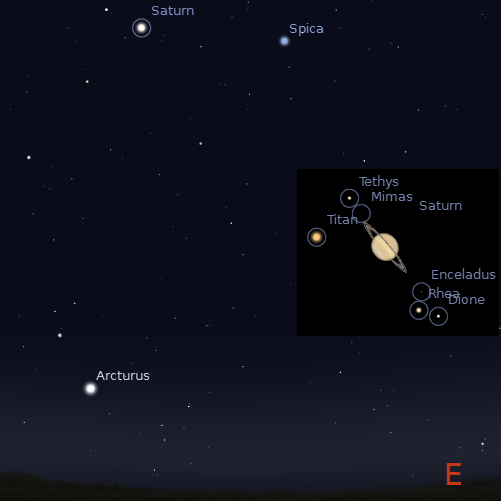 Saturn is well placed for telescopic observation in the evening sky. Morning sky looking east as seen from Adelaide at 6:00 am local time on Monday April 25 showing Venus, Mars, Mercury and Jupiter in Pisces. Similar views will be seen elsewhere at the equivalent local time. Click to embiggen. The Last Quarter Moon is Monday April 25. Bright white Venus is readily seen in the early morning sky in Pisces. Venus is "gibbous" phase, and will progressively become more full (and smaller) over the coming weeks. Below Venus is a string of bright planets which will enliven the sky over the coming weeks. Mars is visible in the eastern twilight below Venus. As the week progresses it will become even more prominent. Mercury and Jupiter are below it in the morning sky. Mercury continues to climb rapidly and draws away from Mars closing in on Venus. 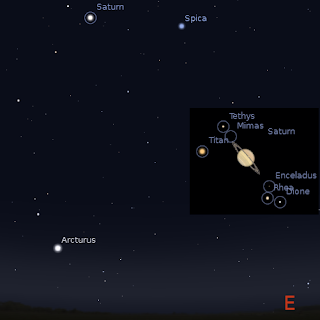 Evening sky on Sunday April 24 looking east as seen from Adelaide at 8:00 pm local time in South Australia showing Saturn near Spica. Similar views will be seen elsewhere at the equivalent local time. Inset,the telescopic view of Saturn on the 24th , you will need a fairly large telescope to see any moon other than Titan. Click to embiggen. 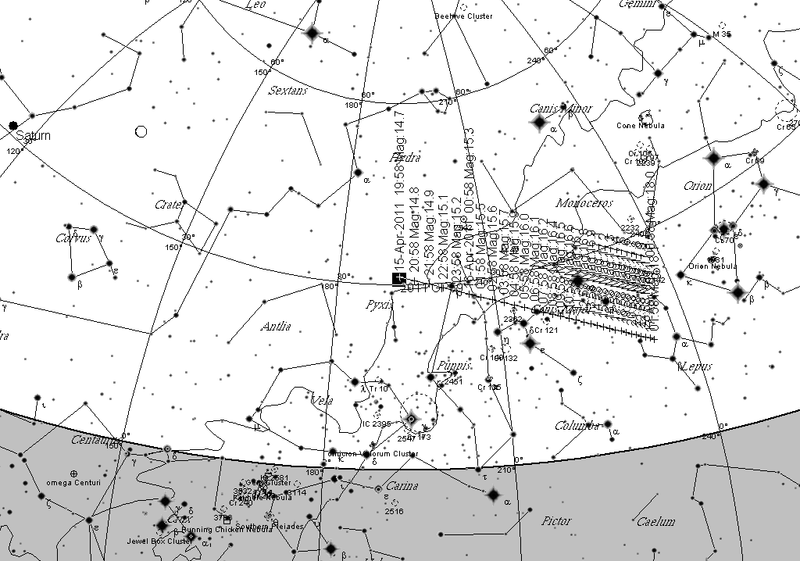 Chart of Near Earth Asteroid 2011 GP59 as it zoomed past on April 15. 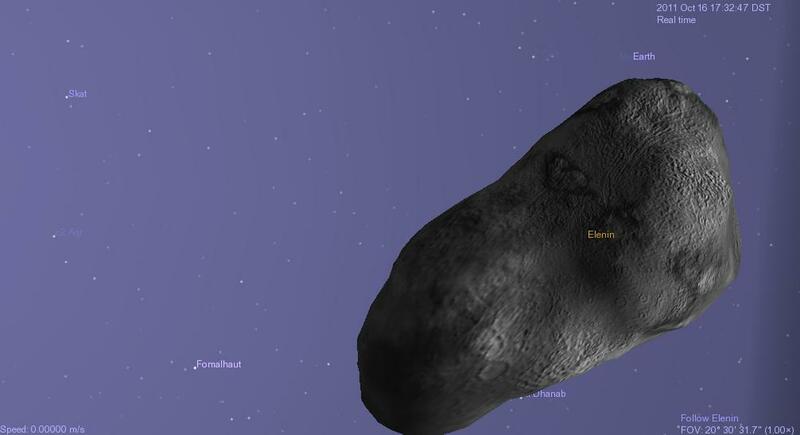 Near Earth Asteroid 2011 GP59 sailed past the Earth on April 15 at 1.5 times the Earth-Lunar distance. The elongated asteroid rotates in such a way that observed from earth it's brightens changes substantially, so it looks as if it is flashing. You can see two videos of the asteroid as it shot past here and here. and CCD time series -- are encouraged. months) when T Pyx is lost behind the Sun. photometry, T Pyx can be followed down low on the horizon. lynchpin of many arguments and discussions for the progenitor problem. T Pyx will become a Type Ia supernova. Database using the name "T PYX". campaign and for your contributions to this fundamental research! The current passion for astronomical doomsday, as exemplified by unwarranted concern about comet C/2010 X1 Elenin and the mythical planet Nibiru, is sad, given the wealth of real, interesting but non-threatening astronomical events happening. However, we can use this interest as a “teachable moment” to give people a better understanding of the sky and the people who watch it. I was recently forwarded an email from someone who was puzzled as to why amateur astronomers had not detected Nibiru, and what he could do to search for himself. Firstly, how do you go about finding an unknown object? At this very moment, hundreds of amateur astronomers are scanning the sky looking for a glimpse of an as-yet undiscovered comet or asteroid (as well as the supernova hunters). Similarly, robotic telescopes such as LINEAR are also scanning the sky, looking for asteroids that have the potential to come threateningly close to Earth. By definition, we don’t know where these objects are, but we can make educated guesses. Asteroids are mostly found in roughly the same plane as Earths’ orbit, so asteroid surveys tend to be around the ecliptic. Comets can come from any direction in the sky, so we have to cover most of the sky when looking for them. Generally, most amateurs work systematically, regularly observing a broad swath of sky repeatedly over a number of days. In these days of CCD cameras, multiple wide field images are taken, and the images inspected for points of light that move between successive exposures. Then comes the task of deciding if these moving points are instrument glitches, a known object, or a real discovery. Pluto imaged by myself with the Global-rent-a-scope GRAS05 instrument, a typical serious amateur instrument. What are the limits of the objects that amateurs can detect? With modern CCD cameras and instruments, a reasonably well equipped amateur can see objects between magnitude 14 (how bright Pluto is at the moment) and magnitude 18 (the discovery magnitude of some recent comets). So what sort of objects could amateurs be expected to detect? Quite small faint ones; for example, if Earth was at the distance of Pluto, it would be around magnitude 12, readily visible by the majority of amateur comet hunters. So what about Nibiru? What do we know of its properties? Well, it is claimed to have an orbit which takes 3600 years to complete. 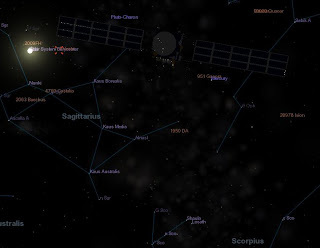 At the moment, it is claimed to be close to the Earths’ orbit around November/December 2012 (there have been other dates, Nibiru was originally predicted to turn up in 2003). From Kepler’s laws we can calculate that the diameter of the orbit must be 496 astronomical Units (AU, the distance of Erath to the Sun http://www.2012hoax.org/nibiru) (see also here http://arxiv.org/abs/1009.1374) compare this with Pluto’s orbit of 39.6 AU. From this we can also work out its orbital velocity (http://www.sjsu.edu/faculty/watkins/orbital.htm) which turns out to be 3.8 x 108 Kilometres per year (or roughly 2.5 AU a year). Working backwards, we find that right now, today, Nibiru should be about 4.2 AU away, closer to us than Jupiter is. How bright would such an object be? It depends on the size of the object and how reflective it is. The Moon isn’t very reflective, its surface is quite dark, but it is very bright because it is close to us. There is a formula to work out how bright any given object is (http://space.wikia.com/wiki/Absolute_magnitude). The formula is a little messy, depending on the angle of illumination of the object, but any object outside Earths’ orbit will be at least 2/3 illuminated. 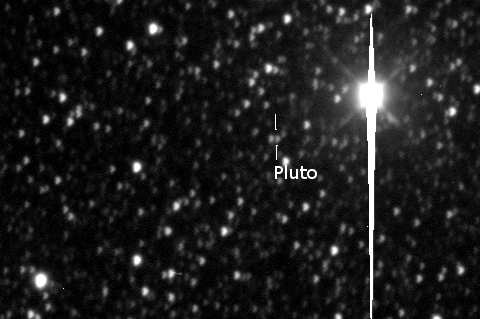 If we assume that the object is the size of Earth, and is as reflective as Pluto (a good assumption for an object allegedly coming from the outer solar system), then it will have a magnitude of around 4, faint but easily visible to the unaided eye in all but the most light polluted skies. At the very least the supernova hunters would have noticed it, let alone the comet and asteroid hunters, months ago. If it was at the orbit of Saturn, about a year ago, then it would be around magnitude 6, easily visible in binoculars. That is for an Earth-sized object, but Nibiru is claimed to be larger. The size given for Nibiru is varied, but usually runs from Jupiter sized, to many multiples of Jupiter’s size (from Brown Dwarf stars to Red Dwarfs). A Jupiter sized planet at the calculated current distance of Nibiru would have a magnitude of -1 to -2. That is it would be outshining most stars and really, really obvious. Is there a way for Nibiru to remain invisible? One person maintains that Nibiru is already in the inner solar system, just inside the orbit of Venus only 69 x 106 kilometres away. It is not visible because it is too close to the Sun. However, to have crossed the inner solar system in the first place it would be highly visible. The only way it could be hidden is to have a highly unlikely orbit, where Nibiru precisely tracks Earths orbit around the Sun, from when Nibiru is magnitude 12. This is amazingly, astoundingly unlikely. But that only hides it incompletely from Earth. As people know, I spend a lot of time looking for Venus in the daylight. An Earth sized object would be visible in daylight to a reasonable distance from the Sun (just like Venus). A Jupiter sized object just inside Venus’s orbit would be magnitude -10. It would be a crescent phase, but still very bright and easily visible in daylight even quite close to the Sun, as well as readily visible just after Sunset. Even if Nibiru was as black as coal it would be bright from the reflected light of the Sun. Nibiru can't hide from the STEREO satellites. And let’s not forget the satellites, the STEREO and SOHO instruments are watching the Sun from different angles to Earth, an Earth sized object would be painfully obvious in either of the STEREO instruments (either ahead or behind), as well as the SOHO instruments. The dedicated bands of comet hunters who peruse the raw STEREO and SOHO images looking for comets would notice something immediately. So an Earth-sized, unknown astronomical object would be picked up by the amateur astronomical community in the outer solar system, any such an object would be visible to the unaided eye by the time it reached Jupiter’s orbit. Anything of Jupiter sized or bigger would be painfully obvious by the time it reached Jupiter’s orbit. It couldn’t be hidden by anybody. You yourself can go out this afternoon or evening and confirm that there is no Nibiru, using just your eyes. An Iridium flare passes between Procyon and alpha Hydri, just above the Moon (click to embiggen). 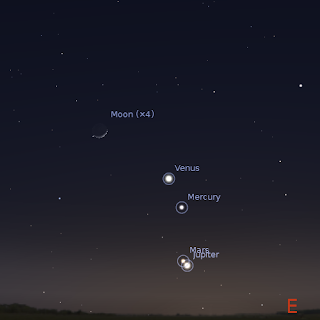 Morning sky looking east in Adelaide showing the Moon, Venus, Mercury, Mars and Jupiter at 6:00 pm local time on Saturday April 30 (similar views will be seen from other cities at the equivalent local time). Click to embiggen. Mercury Mars and Jupiter join Venus for an extended planet dance. Saturn is at opposition, when it is biggest and brightest as seen from Earth. Saturn is now an excellent telescopic object in the evening rising at Sunset. 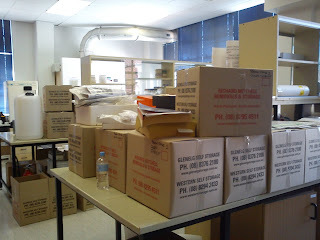 Sorry about Southern Skywatch being late, But with family visitors, having to move my lab at short notice (see image) and having the powerpack to my laptop die rather spectacularly, things kind of got away from me. The Full Moon is Monday April 18. Venus is visible in the morning sky in the constellation of Pisces. Mars is visible below Venus in the early morning. Mercury and Jupiter join them this week, with Mercury close to Mars on April 20. 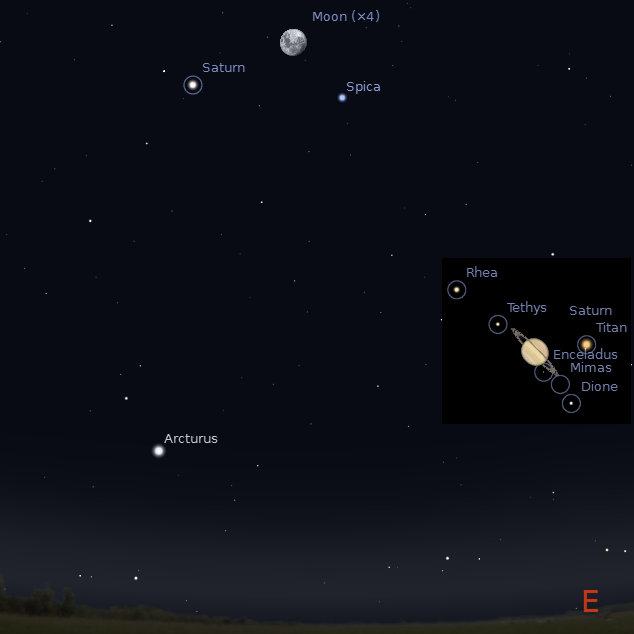 Saturn is well placed for telescopic observation in the evening sky. 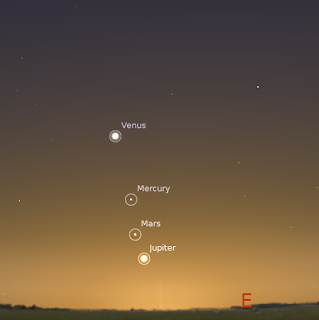 Morning sky looking east as seen from Adelaide at 6:00 am local time on Wednesday April 20 showing Venus, Mars, Mercury and Jupiter in Pisces. 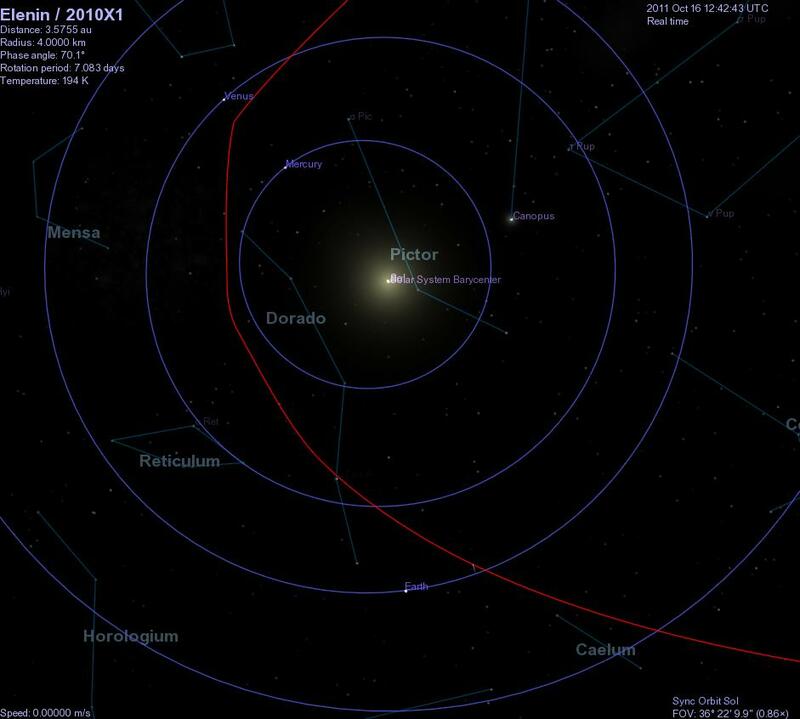 Mars and Mercury are at their closest at this time. Similar views will be seen elsewhere at the equivalent local time. Click to embiggen. The Full Moon is Monday April 18. Bright white Venus is readily seen in the early morning sky. This week it is in Pisces. Venus is "gibbous" phase, and will progressively become more full (and smaller) over the coming weeks. 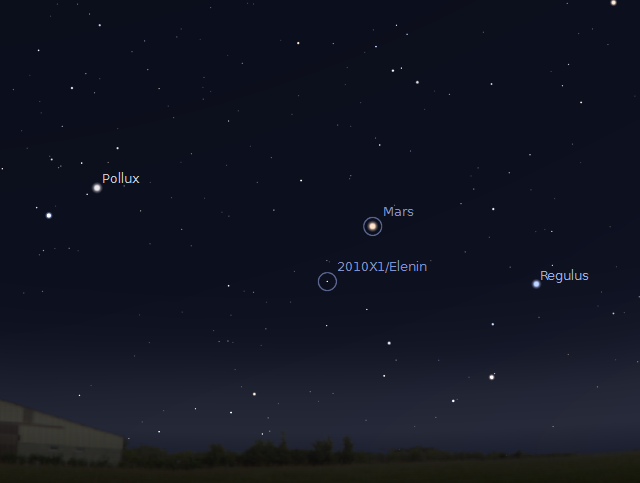 Below Venus is a string of bright planets to enlive the sky over the coming weeks. 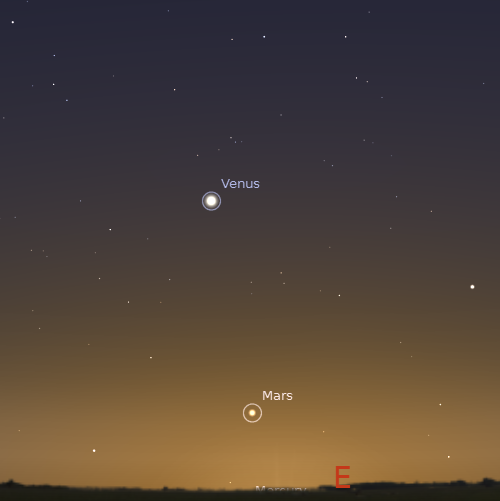 Mars has returned to the morning sky and is visible low in the eastern twilight below Venus. As the week progresses it will become even more prominent. Mercury and Jupiter return to the morning sky. Mercury climbs rapidly into the morning sky and has a close encounter with Mars on the 20th. Jupiter appears low on the horizon, but only later in the week is it appreciably high enough (4 degrees half an hour before sunrise), for it to be readily seen. Even then you will need a fairly clear, level eastern horizon to pick it up. Evening sky on Saturday April 17 looking east as seen from Adelaide at 9:00 pm local time in South Australia showing Saturn near Spica with the Moon between them. Similar views will be seen elsewhere at the equivalent local time. Inset, the telescopic view of Saturn on the 17th , you will need a fairly large telescope to see any moon other than Titan. Click to embiggen. Saturn is rising with sunset, and is visible all night long. It is high enough for telescopic observation in the late evening. It readily visible as the bright yellowish object not far from the bright star Spica. The asteroid Vesta is quite faint (magnitude 7.6), so you need binoculars to see it and may need to watch over a number of nights to make sure you are seeing it. Currently Vesta is not near anything interesting. Vesta is brightening and will be (just) visible to the unaided eye in a few months time. A chart showing Vesta's location is here. The Federal Government allegedly plans to cut biomedical research in the next budget by reportedly $400 million. As the total National Health and Medical Research Budget is only around $750 million this would slash medical research in Australia by nearly half (State and philanthropic funding of medical research is a minor contributor to all over medical research funding). Australia punches well above it's weight in research in terms of discoveries and publications, with relatively low funding levels. To cut research funding this savagely defies belief. Apart from blocking the discovery pipeline for new disease treatments in Australia, the flow on effects in lost jobs, stifled career prospects and loss of talent overseas will be substantial. Research and Development not only increases the health of ordinary Australians, but we get $3 back in economic growth for every dollar spent on research. At the moment, only roughly one in 5 research applications are funded, and as a long term reviewer of grants for the NH&MRC I can say that world class grants are currently missing out on funding. If the proposed cuts come through less than one in ten grants will be funded, with enormous loss. Read more at discoveries need dollars. ADELAIDE - Steps of Parliament house, North Terrace - Tuesday 12 April @ 12:30PM (Adelaide time) RSVP via Rally for Research Facebook page (you need to be logged into Facebook to view this page). CANBERRA - John Curtin School of Medical Research, ANU Bldg 131, Garran Road - Tuesday 12 April @ 12:30PM (AEST) RSVP via Rally Against NHMRC Budget cuts Facebook page (you need to be logged into Facebook to view this page). More information here. If you can't come, there is a virtual rally here. Please also sign the electronic petition (you may need to wait because of the number of hits it is getting). Carnival of Space #192 is here. Carnival of Space #192 is now up at Vega 0.0. Ther's the solution to the Pioneer anomaly, the possibility of new physics, heavy space launchers, exoplante investigations, students using the Gemeni space telescopes and more. Suit on up and head on over. 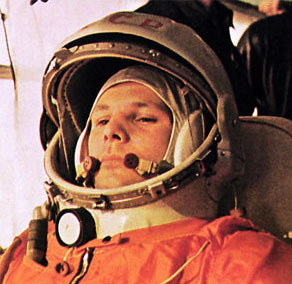 On Tuesday 12 April it will be the 50th anniversary of Yuri Gagarin's historic flight into space. Yuri's Night celebrates this event. There will be events worldwide and here in Adelaide there will be a free movie at 7:00 pm on Tuesday 12th April 2011 in the Kerr Grant lecture theatre, Physics building at the University of Adelaide. ...film maker Chris Riley of In the Shadow of the Moon fame has teamed up with the European Space Agency and the Expedition 26/27 crew of the International Space Station, to create a new film of what Gagarin first witnessed fifty years ago. By matching the orbital path of the Space Station, as closely as possible to that of Gagarin’s Vostok 1 spaceship, and filming the same vistas of the Earth through the new giant cupola window, astronaut Paolo Nespoli, and documentary film maker Christopher Riley, have captured a new digital high definition view of the Earth below, half a century after Gagarin first witnessed it. Weaving these new views together with historic recordings of Gagarin from the time (subtitled in English) and an original score by composer Philip Sheppard, they have created a spellbinding film to share with people around the world on this historic anniversary. The film is sponsored by The Australian Institute of Physics and the Adelaide Section of the American Institute of Aeronautics and Astronautics. For more information email Scott Foster. Carnival of Space #191 is now up at the Planetary Society blog. There's the first images from Mercury, Endeavour trundling across the Martian plains, protoplanets, life from Mars and much much more. Blast off and have a read. The First Quarter Moon is Monday April 11. Venus is visible in the morning sky in the constellation of Aquarius. Mars is visible below Venus in the early morning. 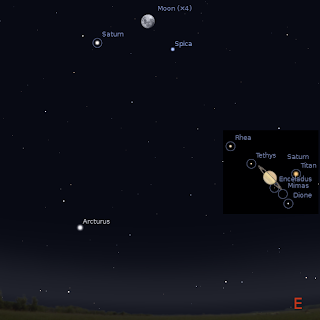 Saturn is well placed for telescopic observation in the evening sky. Morning sky looking east as seen from Adelaide at 6:00 am daylight saving time on Thursday April 14 showing Venus in Aquarius, above Mars. Similar views will be seen elsewhere at the equivalent local time. Click to embiggen. The First Quarter Moon is Monday April 11. Bright white Venus is readily seen in the early morning sky. This week it is in Aquarius. 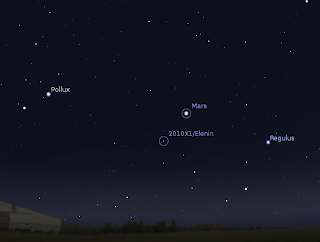 Mars has returned to the morning sky and is faintly visible low in the eastern twilight below Venus. As the week progresses it will become more prominent. 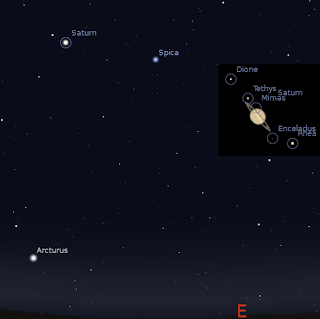 Evening sky on Saturday April 9 looking east as seen from Adelaide at 10:00 pm daylight saving time in South Australia showing Saturn near Spica. Similar views will be seen elsewhere at the equivalent local time. Inset, the telescopic view of Saturn on the 14th , you will need a fairly large telescope to see any moon other than Titan. Click to embiggen. Even in small telescopes you can see Saturn's rings and it's moon Titan. Saturn is at opposition on April 4th, this is when Saturn will be at its biggest and brightest. While opposition is on the 4th, Saturn will be big and beautiful for many weeks to come. Homeopathy is an alleged therapy which combines 18th century alchemy with extreme dilutions, such that the probability that there is one molecule of the starting material in any "remedy" is negligible. Many people think there is something to homeopathy, but many people also think that the full moon is linked to accidents and criminal behavior, let alone earthquakes, when in fact there is no such link.We are easily fooled by our preconceptions and selective recall, and so it is for homeopathy. If you want reliable information on homeopathy, I suggest these sources. Start at the 10:23 campaign for a good one-stop basic information source. For more detail, over at Science based medicine, there is a good, easily readable series on homeopathy. You might also like to know that homeopathy has been failing clinical trials since 1835. Then there is the weighty House of Commons Science and Technology Committee (STC) report, Evidence Check 2: Homeopathy, which concludes that there is no evidence that homeopathy works any better than placebos (commentary here). Then there are the following posts on a recent trial of an alleged homeopathic breast cancer remedy from Orac (with follow up) and Australia's own Dr. Rachie (I appear in the comments). If the above is all a bit heavy, maybe some light entertainment from Orac, or a song from Australia's Tim Minchin will help lighten the mood. Got a passion for science? Got something to say? Want to do it using Blogging or the New Social Media but don't have a clue how to start? Then this ASCA event is for you. For this workshop participants will need to bring their own wireless internet (wi-fi) capable machine and have an email account that can be accessed from a web browser (for example gmail). 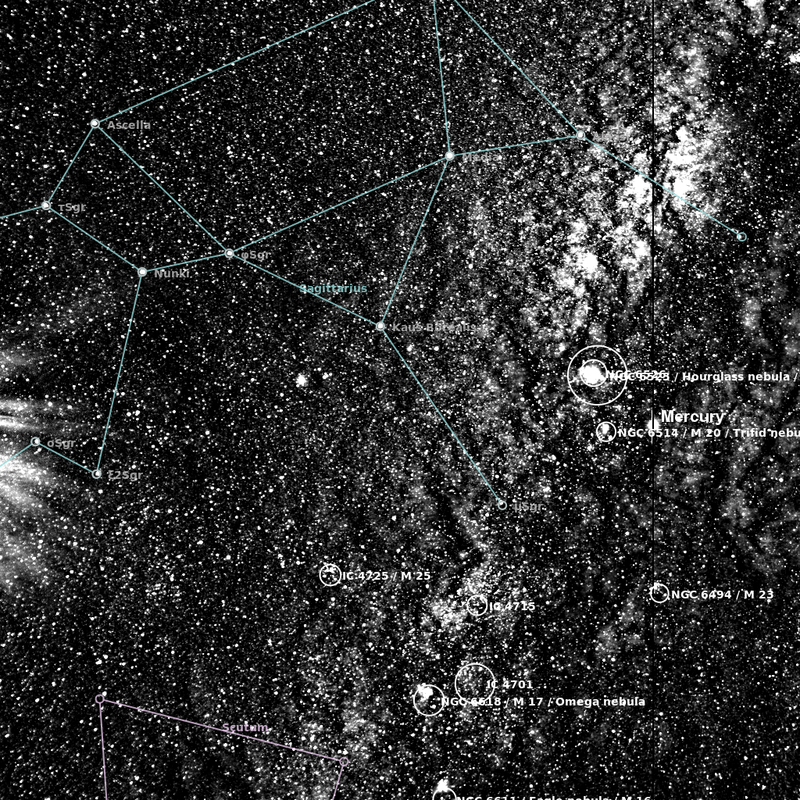 216 Kleopatra and its moons as visualised using Celestia. 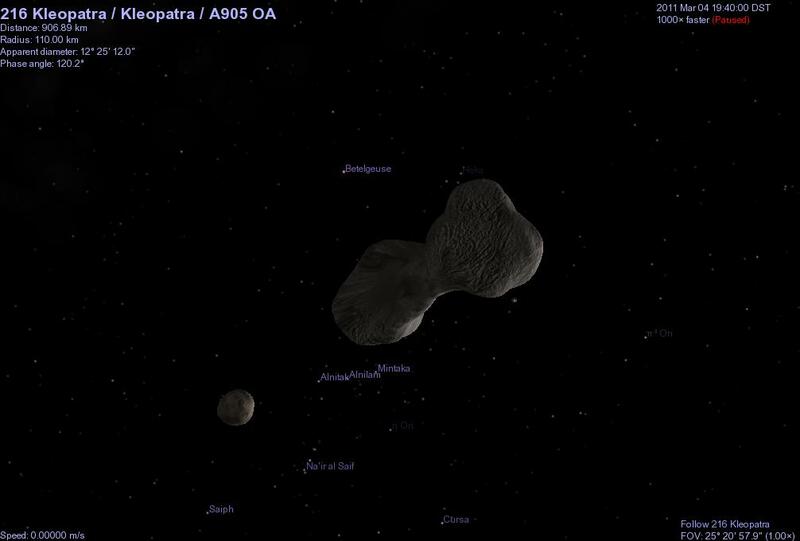 216 Kleopatra is a rather unusual asteroid. Not only does it look like one of those cartoon dog bones, it has two moons. Now, if you ask some random person off the street, or a kid, to define what it means to be a planet, they will often say "it has a moon". 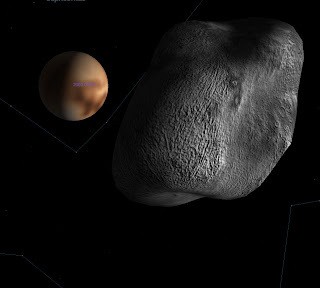 However, in 1993 the first asteroid moon was was discovered when the Galileo probe imaged Dactyl orbiting 243 Ida. Astronomers has suspected that asteroids might have had moons long before though, but the images of Ida and Dactyl were particularly amazing. Since then we have been discovering asteroidal moons hand over fist and have described around 190 of them. We are not sure exactly how asteroids gain their moons, although chunks of asteroids knocked off by impact may explain some examples. 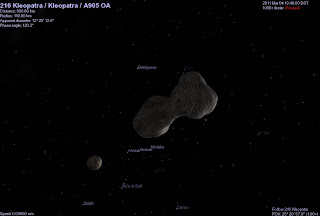 216 Kleopatra is one of the more unusually shaped asteroids (hey, there are ones that look like flying saucers! ), and it's moons (Cleoselene and Alexhelios, named after the original Cleopatra's children) were discovered in 2008. While there are lots of asteroids with a known single moon, there are only 6 known asteroidal systems with two moons. Not only is Kleopatra's shape unusual, but recently published paper by by Pascal Descamps et al, used measurements of the orbits of its moons to determine Kleopatra's mass and density. It turns out Kleopatra is between 30% to 50% empty space! You can read the original paper here, Emily Lakdawalla's take on it here and the Bad Astronomer's take here. Naturally, I've made a Celestia file for you to add. Kleopatra is already in Celestia 1.6 so just copy the data between the lines into a file called kleomoons.ssc (or whatever you like), and copy that file into the Celestia extras folder. "Alexhelios:216 Kleopatra I:Kleopatra I:A905 OA 1" "Sol/Kleopatra"
"Cleoselene:216 Kleopatra II:Kleopatra II:A905 OA 2" "Sol/Kleopatra"